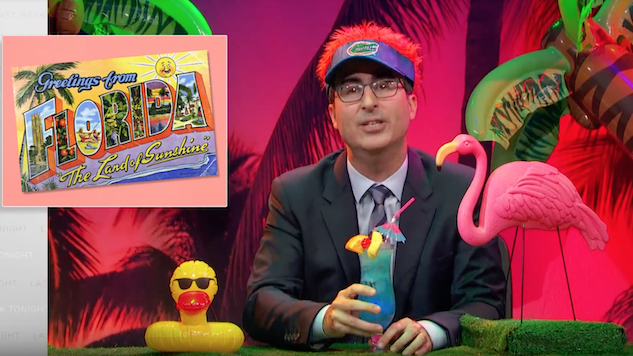 “So please, on Nov. 6, for one day—just one day—don’t take your goat for a walk in your underwear, stay away from any bite-y otters, draw a fake beard on yourself and go cast a vote on behalf of all your fellow Floridians who are unable to,” pleads John Oliver to close his latest Last Week Tonight segment, surrounded by inflatable palm trees, fake grass and a plastic pink flamingo. Tackling felony disenfranchisement, Oliver turns his focus to sunny Florida as the target for his latest long-form comedic takedown. The nation’s six million disenfranchised voters aren’t evenly distributed across the county and in a state like Florida—in which the requirements to regain voting rights include waiting years to apply, applying and then convincing a clemency board (that possesses full discretion to do as it pleases with no explanation) of your rehabilitation—the issue is particularly prevalent. “I’m sure that’s true, but it’s just weird to hear it said out loud,” comments Oliver. Yeah, sounds about right. Ending the segment, he encourages those who are actually allowed to vote in the state to take action through passing a Voter Restoration Amendment—allowing nonviolent felons to have their rights restored—on the midterm ballot. Watch Oliver’s latest segment below.